The fruit of an apple tree or a grapevine is harvested and eaten by others. Jesus’ point in using the image of fruit, is that Fruit is something that benefits others. The fruit spoken of by Jesus, are the things that God would have us do for others – works of love, acts of generosity, caring, helping, serving, telling others of God’s love, passing on our faith, teaching our children – all the good things that God would have us do for the sake of others. “I am only … I can’t do that.” These are words that have the power to stifle anything we consider too challenging or too demanding. We hear those words and excuses spoken numerous times in the Bible. When God spoke to Moses at the burning bush, and told him to deliver God’s people from slavery to Pharaoh, Moses tried to excuse himself saying, “Who am I … suppose they don’t believe me … I have never been eloquent. I am slow of speech.” (Exodus 3:11; 4:1; 4:10). So, here’s what we discover from these people in the Bible – When God chooses people and calls them to do something, he knows what he’s doing. God can see past our weaknesses and insecurities and sees the real potential within each of us. But then, God assures us that he will be with us. And now, God has come to us. •	to be God’s feet, going to those in need, and God hands, to demonstrate God’s love through our care and love. Through our daily lives in our communities, our daily lives with our families, our daily lives in our places of work, and in our involvement in the ministry of this church, God gives us opportunities to answer his call to serve. Our theme for this month of May is, “Take hold of the life that is really life.” Jesus says to his disciples, and to us, “You did not choose me, but I chose you. And I appointed you to go and bear fruit.” (John 15:16) According to Jesus, a life that is really life, is a life lived for the sake of others. It’s important for us to read those words carefully, especially when we feel inadequate. It is Jesus who chooses us. This is God’s work. We are but his hands and feet, his ears and mouth. 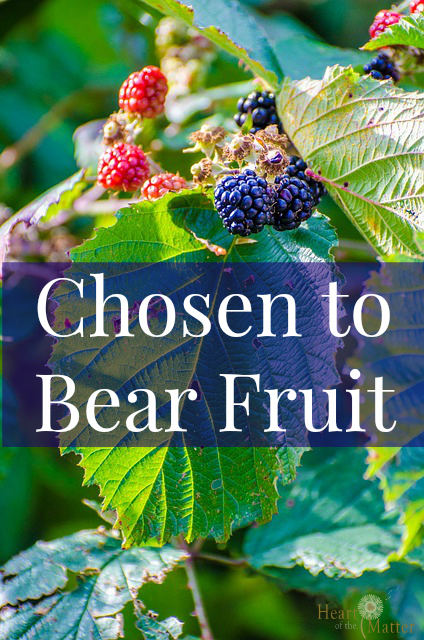 Jesus chooses us and appoints us to bear much fruit. We can be sure he won’t call us to do something for which he will not also equip us. But also remember, Jesus sees the potential in us that we sometimes do not see in ourselves. And we can be sure that he will help us in our times of hesitancy and lack of confidence. He will provide us with a community of others – all of us struggling to find our place in Jesus’ mission and ministry, and we will pray for one another and encourage one another to be what he has chosen us to be. In both of our readings today, we are instructed to “love one another.” The love that is in view here is the love we see in Jesus – patient, kind, merciful, generous. This love for one another is important for our church, because this is how we find the support and the courage to step out of our comfort zone, to extend ourselves beyond what is easy, and to expand the ministry and mission of St. John Lutheran Church. And Jesus adds an additional assurance when he says, “I have called you friends.” (15:15) Jesus doesn’t see us as his servants, but as his friends. It means that he gives himself to us as our companion and partner in his mission. He will walk with us, forgive us, and work alongside of us. He loves us and will never give up on us. When we hesitate and wonder what we could possibly say and do, remember the words of Jesus: “You did not choose me, but I chose you. And I appointed you to go and bear fruit.” He will provide us with the strength and opportunities to partner in his work of mission and ministry – in our daily lives, in our families, in our work, in our church – and to bear much fruit.